All the summer games Overwatch skins are so beautiful but I haven't had time due to conventions to grind for skins T_T!! 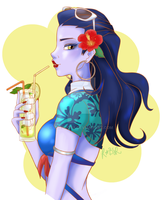 Widowmaker is so beautiful is this drawing! ahh yeah the skin makes her even more gorgeous hehe THank you so much!! It's wonderful! I love how you made the woman and the background!